My System (German: Mein System) is a book on chess theory written by Aron Nimzowitsch. Originally over a series of five brochures from 1925 to 1927, the book - one of the early works on hypermodernism - introduced many new concepts to followers of the modern school of thought. It is generally considered to be one of the important books in the history of chess. The book is divided into three parts: The Elements, Positional Play, and Illustrative Games. The next part, Positional Play (German: Das Positionsspiel), is based largely on the elements taught in the first part. In it, Nimzowitsch tells how to play for a positional advantage. In particular, he argues that the center can be effectively controlled using pieces instead of pawns. This concept, now widely accepted, is one of the fundamental principles of hypermodernism. 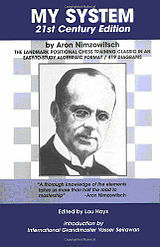 Illustrative Games contains annotated versions of fifty of Nimzowitsch's career games, which he refers to throughout the text.